Mexican politician and general Antonio Lopez de Santa Anna wrote these memoirs during his final exile in Havana in 1872. Sometimes referred to as “the Napolean of the West,” Santa Anna — who served as president of Mexico in multiple, non-consecutive terms — is infamous for losing control of Texas and the extensive territories of the U.S. Southwest in 1836. Antonio López de Santa Anna. “Mis memorias, escritas de mi puño y letra sin ayuda de nadie,en mi último destierro,” 1872. Paper. 12 x 7 in. Genaro Garcìa Collection, Benson Latin American Collection. Mark Goodwin is a project assistant for HeadsUpGuys and student librarian in the Music, Art and Architecture Library at the University of British Columbia in Vancouver. He undertook a practicum with Music Librarian David Hunter of the Fine Arts Library at UT this spring. He has graciously provided the following reflections on his time in Austin. For my two-week practicum, I was extremely fortunate to be given the opportunity to work under Music Librarian and Musicologist Dr. David Hunter at the Fine Arts Library at the University of Texas in Austin. My time there resulted in profound growth on both a professional and personal level. 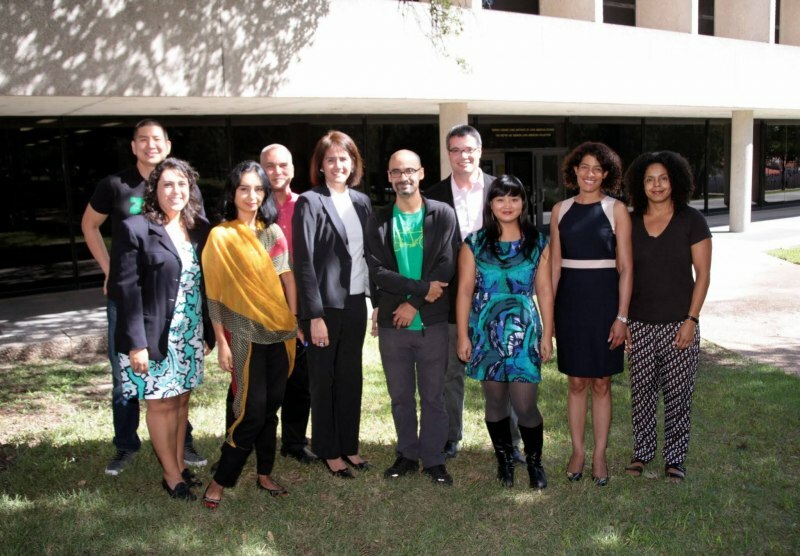 On Monday, September 23, Pulitzer Prize winning author Junot Díaz stopped by the Benson Latin American Collection as part of his tour of UT before his keynote appearance at the Texas Institute for Literary and Textual Studies: Reading Race in Literature and Film. Díaz and a group of UT faculty gathered around the seminar room table where archivist Christian Kelleher had laid out some of the Benson’s treasures on display. These included some of the usual suspects, such as the Relaciones Geográficas (pintura maps from the first census of New Spain, dating back to 1577), the papers of the renowned Chicana theorist Gloria Anzaldúa, and the original manuscript of Rayuela by Argentine author Julio Cortázar. Díaz views Benson special collections items. Díaz’s visit was also a great opportunity to pull out some of the Benson’s lesser known gems, such as our collection of rare books and maps from and about the Dominican Republic, and share our Latino comics collection with a fellow comic book lover. T-Kay Sangwand is the Human Rights Archivist for the Human Rights Documentation Initiative.